The Spring issue of the “Live long. 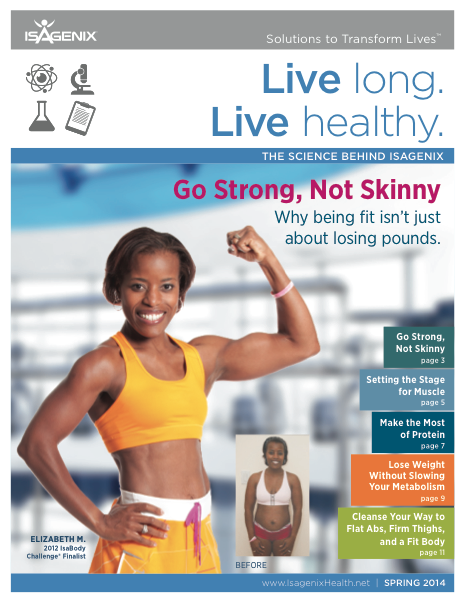 Live healthy.” newsletter explains how to lose fat while maintaining muscle. How you look on the outside might not reflect how you look on the inside. Everyone wants to be skinny, but in no way does “skinny” equate to healthy. You might ask yourself, “Are you skinny fat or a TOFI (thin outside, fat inside)?” If you think you might be, you aren’t alone. In fact, normal-weight obesity is quite common. When researchers at Imperial College, London, scanned 800 people of a normal body weight with MRI machines, they found that up to 45 percent of women and 60 percent of men had high percentages of body fat. Most of this fat was deposited in and around internal organs. This fat, known as visceral fat, is most dangerous to health because of its association with raised risk of chronic diseases like type-2 diabetes and cardiovascular disease. As you’ll learn in this Spring 2014 newsletter, the focus should be on losing visceral fat while holding on to muscle. That’s because muscle (as opposed to visceral fat) not only looks good, but also plays a central role in metabolism, supporting immunity, guarding against disease, and prolonging longevity. In these next few pages our Research and Science Team explores why strong is the new skinny.